Minimize countertop mess by cooking with this handy spoon rest nearby – it’s the perfect spot to perch utensils between stirs, flips, and slices. This elegant piece also makes a great dipping dish for any entertaining needs. A clever way to store or display up to a dozen or half dozen fresh, hardboiled, or deviled eggs, this wooden board has ergonomic handles that allow for easy maneuvering around the kitchen, dining room, or entertaining space. It’s a true farm-to-table addition for any kitchen. This petite wooden board is a clever way to store or display up to six fresh, hardboiled, or deviled eggs. The ergonomic handles allow for easy maneuvering around the kitchen, dining room, and entertaining space. It’s a true farm-to-table addition for any kitchen. Shake things up with a stylish shelter for your salt. This clever storage solution easily makes cooking more enjoyable, as well as keeping salt flakes fresh and dry. This perfectly petite pottery looks adorable in the kitchen and around the home. Use it to hold salt and pepper, spices, sauces, jewelry, or bobby pins. Sold individually Classic in form and function, and crafted with a stainless-steel dispenser, this olive oil bottle is both useful by the cooking range and beautiful on the table. Serve cheese and crackers or your favorite appetizer on this unique platter – individually handpainted by artisans, each is one-of-a-kind and lends a distinctly personal touch. The smooth, round shape of this mug just feels good in your hands - whether you fill it with foam, whipped cream, or marshmallows, it is sure to make your sipping experience that much cozier. Designed with a flowing rim and an organic shape, this beautifully handcrafted bowl adds visual and textural interest to any kitchen or table. Make countertop clutter a thing of the past with this versatile and aptly named crock. The sturdy design and helpful size make this piece a must-have that you’ll use throughout the entire house. Once you get your hands on this bowl, you'll never let it be far from reach. Whether it’s used for mixing ingredients, rising dough, whisking eggs, or just holding fruit, this vessel is both beautiful and incredibly useful. The easy-to-pour spout makes cooking and baking a breeze. This helpful bowl makes any fruit a breeze to clean and presents all fresh produce with handcrafted elegance. It holds more than a pint of berries and easily fits in the refrigerator. Hand carved by potters using a special technique, this handy little piece allows you to strike matches directly on the specially blended stoneware surface. This modern stoneware piece has proven to be a multi-purpose tool in any farmhouse kitchen. Mash up homemade guacamole, muddle fruit for a cocktail or mix up your favorite creation. A fresh take on the classic French beurrier, this butter keeper allows you to store butter outside of the fridge, while maintaining freshness and spreadability. Here in Rhode Island, we handcraft absolute best-in-class, heirloom quality copper cookware for clients ranging from the passionate home cook to the gourmet restaurants of Relais & Châteaux. Under one roof, we spin the copper, rivet the handles, tin-line the cooking surface, and finally polish the finished piece. Silver-lined copper pans are the ultimate technical cooking tools. Silver is a great conductor of heat - much better than tin - and even BETTER than copper. This translates to a supremely even-heated cooking surface offering superb temperature control. These silver-lined pans are individually made to order. 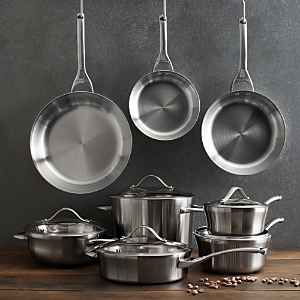 Each piece is hand-crafted specifically as a silver-lined pan. After the pan is assembled, both the exterior AND interior are polished. This polished cooking surface is then lined with silver to a near mirror finish. Handcrafted and American-made fry pan. Made with slightly thinner gauge copper for a lighter-weight pan, this piece is designed to move on the stove. Solid copper, silver or tin lining and cast iron handles. Silver-lined copper pans are the ultimate technical cooking tools. Silver is a great conductor of heat - much better than tin - and even BETTER than copper. This translates to a supremely even-heated cooking surface offering superb temperature control. Handcrafted and American-made butter pan. Solid copper with silver or tin lining and brass handle. Handcrafted and American-made sauce pan with pouring lip. Solid copper with cast iron handles. Silver or Tin-lined by hand. Handcrafted and American-made splayed sauce pan. Solid copper for greater temperature control on an evenly heated cooking surface. 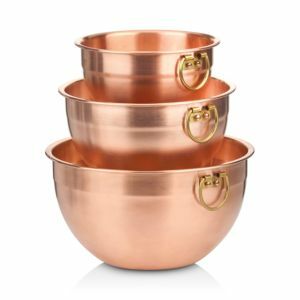 Handcrafted and American-made set of four solid copper pans with silver or tin lining. Handcrafted and American-made sauté pan. This very manageable sauté pan is the perfect size for the home. Solid copper for greater temperature control on an evenly heated cooking surface. Handcrafted and American-made set of three pans. Set includes: 12.5"Dia. tin sauté pan, 8"Dia. tin sauté pan, and 6.5"Dia. tin splayed pan. Solid copper, silver and iron. Made in the USA. Handcrafted Courtly Harlequin oven mitt. Handcrafted Courtly Harlequin apron. Two front pockets. Handcrafted Courtly Harlequin pot holder. Handcrafted oven mitts. Handcrafted pot holders. Handcrafted zigzag oven mitts. Handcrafted Flower Market recipe box. 8"W x 6.5"D x 7.5"T. Hand-glazed, heavy-gauge steel with hand-applied transfer decoration. Glass, acrylic, and brass knob. Includes set of recipe cards and dividers. Flower Market spoon rest. Hand-glazed, heavy-gauge steel with hand-applied Flower Market art. Hand-glazed, heavy-gauge stainless steel handle with hand-applied Flower Market decoration. Heat-resistant nylon and silicone head piece. Hand-glazed, heavy-gauge steel with hand-applied Flower Market decoration. Lid finished with intricately detailed knob of 18/10 stainless steel with antiqued brass finish and bronzed stainless steel rim. Oven safe to 400 degrees. Handcrafted utensil holder. Heavy-gauge, hand-glazed steel underbody with hand-applied transfer decoration. Rimmed in bronzed stainless steel. Hand wash. A treat from MacKenzie-Childs®, even before you fill it with goodies Flower Market baking pan. Hand-glazed, heavy-gauge steel with hand-applied Flower Market decoration. Oven safe to 400 degrees. Handcrafted "Flower Market" ceramic grinder. Heavy-gauge, hand-glazed steel underbody. Hand-applied transfer decoration. Handcrafted of enameled steel with bronzed stainless-steel trim and hand-applied floral transfers. Canister with floral design crafted of enameled steel with ceramic finish. Bronzed stainless-steel trim. Flower Market 1-quart saucepan. 12.5"W x 6.5"T. Hand-glazed, heavy-gauge steel with hand-applied Flower Market decoration. Intricately detailed knob of 18/10 stainless steel with antiqued brass finish. Bronzed stainless steel rim. Oven safe to 400 degrees. Salt and pepper set made of heavy-gauge, hand-glazed steel. Hand-applied transfer decoration. Bronzed stainless steel rims. Dishwasher safe; hand washing recommended. Casserole has a hand-glazed, heavy-gauge steel underbody. Hand-applied Flower Market transfer decoration. Bronzed stainless steel rim and 18/10 stainless steel knob with antique brass finish. 8"Dia. x 16"W x 7.5"T; holds 2.5 quarts. Oven safe to 400 degrees Fahrenheit. Cut and collect. This clever cutting board offers plenty of prep space and three removable plastic trays to hold your sliced and diced ingredients. The building block of a brilliant kitchen. Crafted from attractive oiled hardwood, this end grain board is a quick favorite on your countertop. The reversible design provides a durable & sturdy place to slice, dice & prep, plus built-in finger slots offer easy handling & a secure grip Handcrafted bread knife. Stainless steel, oxidized metal, and 24-kt. gold-plated metal. Soft two-tone glazing accents the clean styling of the Color Striping mixing bowl set from Martha Stewart Collection. Use all three sizes for kitchen prep or as casual serving bowls. Soft summery shades and clean styling make Martha Stewart's Color Striping Dinnerware perfect for everyday dining. The collection's pieces include dishwasher and microwave-safe stoneware plates, bowls and mugs as well as coordinating two-tone ceramic accessories. Soft two-tone glazing accents the clean styling of the Color Striping mixing bowl set from Martha Stewart Collection. Use all three sizes for kitchen prep or as casual serving bowls. Bring gleaming, modern design to your kitchen with Calphalon. Crafted from lustrous, brushed stainless steel, this set combines professional performance and dishwasher-safe convenience. On a quest for healthier cooking, Finex designers rediscovered cast iron as the trusted way to cook without inviting toxic cookware residue into food. A modern aesthetic and innovative features breathe new life into beloved cast-iron cookware. An ergonomic "speed cool" stainless steel handle looks great and stays cool (no need for an oven mitt! ).